Holiday Inn Express hotel in Orange City - Deltona is conveniently located off I-4, giving travelers easy access to local attractions, businesses, and Orlando Sanford International Airport (SFB). Midway between Stetson University/DeLand and Deltona and halfway between Orlando and Daytona Beach. Complimentary internet at 1.2 Gigabit speed on a new all-fiber Wi - Fi network by Cisco using Meraki 802.11ac cloud-managed access points. Centrally located amid a variety of eco-tourism attractions and outdoor adventures like the famous Wings of the West trail, the vibrant arts and culture scene of historic DeLand, the Great Florida Birding Trail, endangered species at the Central Florida Zoo, miles of world-famous trails and manatee at Blue Springs Park. Be sure to visit the DeLand Museum of Art for a look at local and international works of art. Enjoy the action at Orange City Racing and Card Club with 30 table Poker Room. 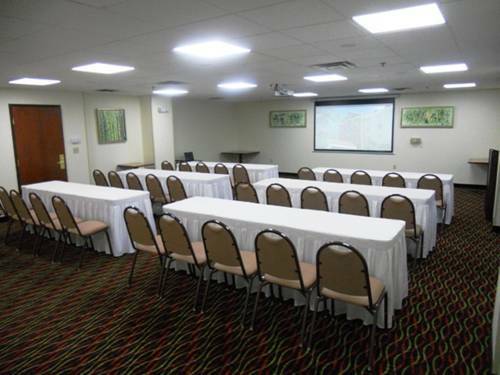 Renovated in 2013 and among the top 6 percent of all Holiday Inn Express hotels for cleanliness. We offer the Express Start hot breakfast buffet free of charge; all rooms feature 42 inch flat screens, refrigerators and microwaves plus large bathrooms with granite counters. Featuring all new mattresses by Serta and bathroom amenities by Bath and Body Works. Enjoy working out in the fitness center and unwind with a dip in the outdoor pool and spa. Print fax produce and create at our complimentary 24-hour business center. Debary Country ClubWith great course conditions, undulating fairways and greens that roll true and fast, it's no wonder that DeBary is consistently chosen as a U.S. Open Qualifying site. St Johns River CruisesThe St. Johns River Cruise is considered the most popular nature oriented tour in Florida. The vessel, the "Native II" was specially designed to ply the shallow backwaters of the historic St. Johns River.